From the intricate costumes to the complex set pieces, SyncOnSet has helped the Game of Thrones production teams to keep details organized and accessible, and as we near the Season Eight premiere, we take a look back at how Westeros came alive under the diligent production design of Gemma Jackson and Deborah Riley. Today we’ll examine the production design in Game of Thrones and learn about the people behind the camera that make the sets of the show come to life. 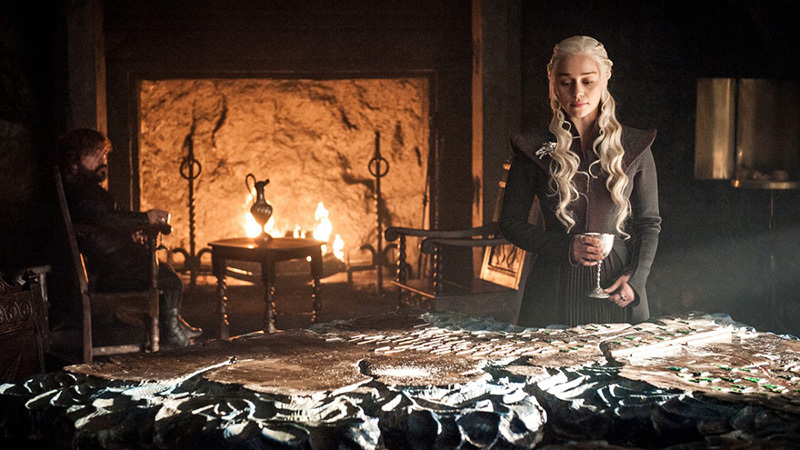 Who’s Game of Thrones’s Production Designer? Game of Thrones was already on the air for four years when they approached production designer Deborah Riley to join the team. She took over as Production Designer for Gemma Jackson, who had already won an Emmy for her work. Those were big shoes to fill. Before Game of Thrones, Riley was the Art Director on smaller indie movies like 21 Grams and Real Women Have Curves, so when she walked onto the set in Belfast, her mind was blown. In a recent interview with the Royal Television Society, Riley says she was “absolutely terrified” when she showed up for her first day. Since 2014, Riley has helped literally sculpt the world of Westeros. From the sept to Dragonstone, she has to get her hands dirty and stay consistent year to year. Her hard work won her a BAFTA last year. Not bad for a woman who started her career in the Art Department on The Matrix and worked her way up. She’s won several Emmy awards for the show since then as well. What are some Production Challenges on Game of Thrones? But it’s not all fun and games within the show. There are some incredibly hard sets to put together and even more intense episodes where it’s all hands on deck. For example, during Season Six, everyone was panicked over the ‘Battle of the Bastards’. There had never been a shoot like that in television history. And when the scripts came in and the VFX people were summoned, more hurdles began to arise. That’s where excellent production design comes into play. Riley and her team were tasked with creating literal walls of dead bodies. For that, she got creative. That is an incredible task. Almost as incredible as overthrowing Ramsay Bolton. But it’s not all battles within the show. What are some inspirations for Game of Thrones’s sets? Sometimes you need to design entire castles and cities. Do you pull those ideas from thin air? No. You sit down and look for inspiration. For example, when Riley was tasked with creating Dragonstone, the home of Daenerys Targaryen, she knew it had to be a place with both functionality, history, and emotion. For that, she drew from the Salk Institute. And what about places like the Iron Bank? Riley and her crew decided that should resemble the evil and stoic nature of the Third Reich. A place defined by its terrible authoritarian rule and cold heart. Throughout all her interviews, it’s clear Riley loves that there were so many architectural styles she could play with inside the show. One such example is Meereen, which trolls online said looked like it ripped off Frank Lloyd Wright. And they weren’t wrong. She took inspiration from him AND she was asked to write for a Frank Lloyd Wright magazine after the episodes aired. Riley called that a professional validation to her style. With all these builds, things can get pretty stressful. Deadlines come quick. Still, they are not creating this stuff overnight. It takes around 200 days to produce a normal 10-episode season of Game of Thrones. That’s 20 days per episode. The number went up to around 250 days in the final 6-episode season. So they spent more than double the time spent filming each episode for the finale. Season Eight needed a whopping 40 weeks to be completed. But those shooting days are probably worthwhile as some estimates have predicted almost twenty million people tune in every week when you count live television and streaming. What can we expect from Season Eight? If you’re like me, then Season Eight of Game of Thrones has you on the edge of your seat. In a recent interview with Deadline, Riley said Season Eight was nearly the end of her life! I don’t think the production design was the death we anticipated at the end of this season. One of my favorite parts of that interview is when Riley describes the “massive builds” that had to happen to get the season moving. Because they shoot all over the world, most of these structural tasks were happening at the same time, so she had to manage her schedule as each underwent construction. While Riley didn’t put forward any spoilers, she did talk about how much pride she’s taken in the past five years of filming. Riley and her loyal crew have definitely accomplished something never before seen on television. Riley says she “cried her eyes out” at the completion of the series and I am sure we will join her when it’s all over too. What’s next? Learn 7 habits of a successful costume designer! Now that you know all about Game of Thrones and its production design, dive deeper into the costumes that make shows come alive. Costume design is one of the most demanding jobs in the film industry, but also the most rewarding. Lisa Padovani, the costume designer from Boardwalk Empire and Gotham, helped us outline seven habits that can make you a better costume designer. Click the link to dive in!